I commonly wonder and get asked about the health benefits of different foods. Turmeric is one that has been studied and gets a lot of attention. Of note, most studies have been small and not very strong. What are the health benefits? Is there a form that is better absorbed? What dose provides the most benefit? In Ayurveda (a 5,000 year old traditional Hindu system of medicine based on plants), turmeric is a versatile herb with many medicinal uses ranging from anti-inflammatory, anti-tumor to inflammatory bowel disease and diabetes. Ancient Ayurvedic formulas include turmeric oils, juices, milk boiled with turmeric and sugar (now sold in certain health food stores in the US! ), boiled tea, lotions and creams. It is used in food traditionally in Indian and other South Asian cultures. It has also had a role in Hindu rituals. 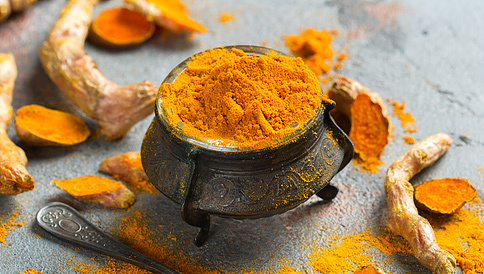 One of the most studied active ingredients in turmeric is curcumin. Interestingly, in its raw state, turmeric is only 2-5% curcumin. Today, it is extracted and sold in the form of supplement tablets (usually 95% curcumin). Curcumin is being researched for its potential beneficial effects of combining it with various anti-cancer drugs, in order to provide more efficient cancer treatment and decrease toxicity from those therapies. In mice, curcumin has been found to improve the gut micro biome by creating a more diverse environment of bacteria, resulting in an anti-tumor effect. Other research has shown its positive effect on gut bacteria has an anti-diabetes, anti-obesity and anti-inflammatory effect. It is used in treatment of arthritis and can reduce the need for pain medication like NSAIDs (ibuprofen). In both animals and humans, studies have indicated curcumin can help prevent cancers like colon, breast, prostate and lung cancers. It is also being studied in treatment of Alzheimer's disease. In countries where there is heavy consumption of turmeric (Indian, Pakistan), lower rates of Alzheimer's disease have been noted. Is eating turmeric in my food enough? Turmeric has other compounds (called polyphenols) that may be providing benefit, curcumin being one that has been studied the most. However, curcumin is not absorbed very well by our bodies. In studies looking at benefits of curcumin, researchers have used forms of the supplement that is "lipidated" or coupled with oil so it is better absorbed. In 2012, a small study done on healthy people taking 80mg/day of lipidated curcumin found they had lower blood triglycerides, lower levels of inflammatory factors, and increased levels of anti-oxidants. Interestingly, black pepper (or piperine) helps in the absorption of curcumin. When adding turmeric to your food, make sure to add some black pepper too! Of note, 1/2 teaspoon of turmeric powder has about 1 gram of turmeric and 30 grams of curcumin (3%). It is generally believed that it is safe to consume (for healthy adults) up to 2000mg turmeric curcumin/day. For general health, adding turmeric powder to our daily food could be beneficial and who doesn't love a delicious Indian curry? Longterm safety is not known but most commonly side effects have been noted to be stomach upset, nausea, dizziness, or diarrhea. For osteoarthritis: 500 mg of turmeric extract twice daily for 2–3 months. For high cholesterol: 700 mg of turmeric extract twice daily for 3 months. For itchy skin: 500 mg of turmeric three times daily for 2 months. If you take any supplements, please notify your doctor as they can interact with medications. Turmeric specifically can cause bruising by thinning the blood when used with NSAIDs (ex. ibuprofen, Aspirin), and other oral blood thinners (ex. Plavix, Warfarin, Enoxaparin, dabigatran). Who should not take turmeric supplements? As it can thin your blood, if you are about to have surgery, please tell your doctor you have been on turmeric and stop it. Pregnant and nursing women, people with gall bladder disease, iron deficiency (it may affect iron absorption) should not use turmeric supplements. Those with hormone-sensitive cancers should consult with their doctors and those with diabetes need to be aware that turmeric can lower your blood sugar. I hope this post inspires you to add this ancient, colorful herb to your foods and you may reap some health benefits as well!